As you have seen in my previous post on First Class amenities, Japan Airlines (JAL) has a separate drink menu in First Class. 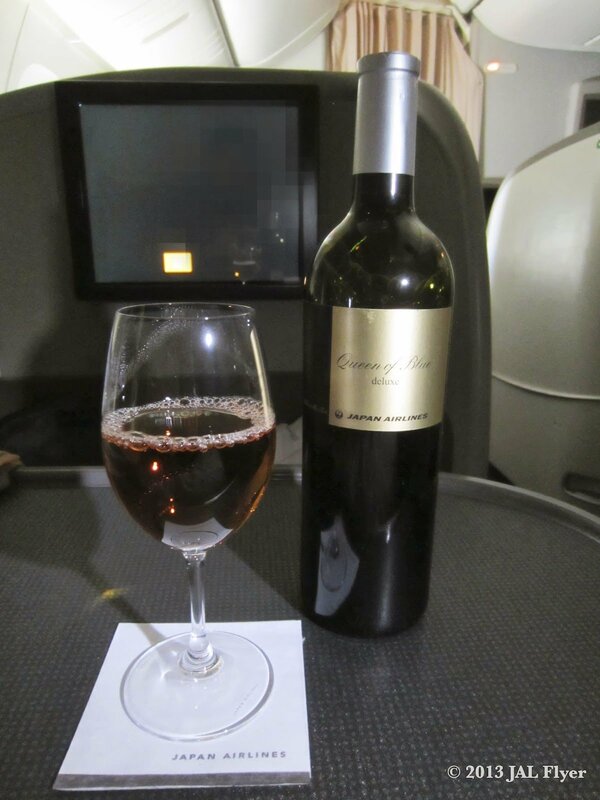 In Business Class, you would only get an insert to the menu telling you what the wine and drink options are. Not in First Class! Ms. Fumiko Arisaka has been in charge of JAL wine list for a long time. She is one of the leading wine journalists in Japan. A lot of JAL cabin attendants (CA) are also qualified members of the Japan Sommeliers' Association and have in depth knowledge of wines. Therefore, they also assist Ms. Arisaka to carefully select the wines to be served onboard. JAL First Class liqueur & spirit menu. The first thing listed are the liqueur and spirit. As you can see, JAL has a very extensive list of liqueur and spirit. I don't really drink alcohol, but my co-worker who does told me this is some really good stuffs and I will take his words for it. Next in the menu is the champagnes. One thing I really like about this menu is that JAL actually gives detail descriptions of each of the wine, champagne and sake offered. This is could really help those who aren't familiar with wines to decide on what they want. 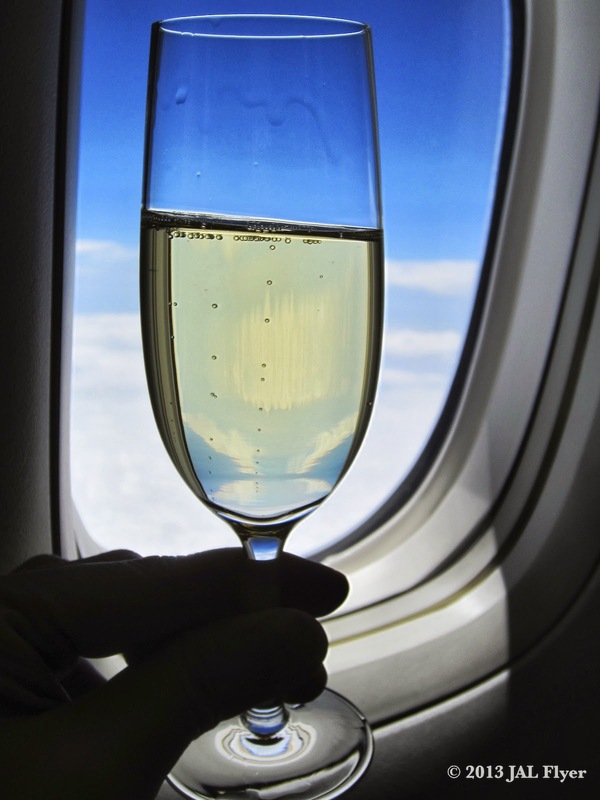 There are two different kinds of champagnes offered on today's flight. They are the JAL exclusive Champagne SALON 1999 and Champagne Dom Pérignon 2003. It's a no brainer for me to order SALON given this is an exclusive offering on JAL First Class. If you want SALON up in the air, you have to fly First Class with JAL (or if you own or rent a private jet I guess). Given I have absolutely zero knowledge in wine and champagne, I will just let JAL describe it for you, as it did for me in the menu. Salon, since the launch of its first vintage in 1921, produces the Champagne Salon only in years when the harvest meets their high standard, and 1999 is the latest vintage among them. Savoring Champagne Salon at 40,000 ft. is a privilege that can only be enjoyed by you, the first-class travelers on JAL.In 1999, the Champagne region experienced a hailstorm in May, however enjoyed a warm August, steadily nurturing the Chardonnay. Already possessing ample maturity, the 1999 vintage expands mellow fruitiness. Rich acidity in an elegant style. One of a kind and only the best. This is the quintessence of Champagne Salon. 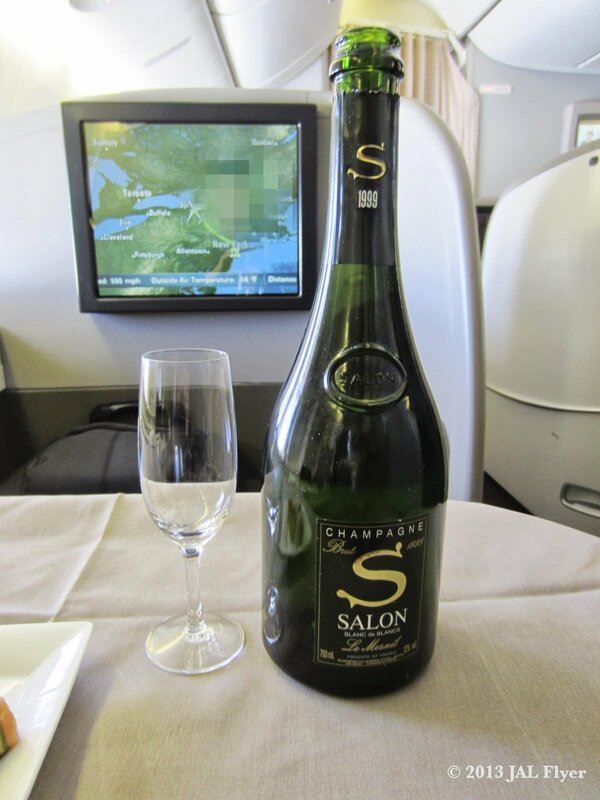 Enjoying Champagne SALON at 40,000 feet in JAL First Class. Following the champagne section are the white wines, red wines and Japanese sake. Since I didn't try any of them (sorry no photos as a result), I will simply list them below. ROYAL BLUE TEA's "Queen of Blue"
Other than these alcoholic drinks, JAL also have something special for the non-drinkers. One of the special drinks on the menu is ROYAL BLUE TEA's "Queen of Blue". Basically it is a premium Japanese tea in a wine bottle. According to JAL, this "ultimate tea" is only made from the finest hand-picked tea leaves at Shonan Cha Kobo and is produced one-by-one. These tea leaves are very rare as they are only picked once a year during the summer time. JAL serves ROYAL BLUE TEA's "Queen of Blue" in a wine glass. The Queen of Blue has won the MONDE SELECTION Gold award for 3 consecutive years in 2007, 2008, and 2009. There are different grades of this tea and the one served by JAL is the lowest Deluxe version. Although it is the lowest grade, by no means it is cheap. A 750ml bottle of this is selling at JPY3,990 on Rakuten. Above this is the Grand version (JPY6,825), followed by Imperial (JPY12,600), and Premium (JPY21,000). JAL uses wine glasses from RIEDEL in its First Class. These are customized wine glasses with JAL branding. JAL serves this tea in a wine glass. Unlike the champagne glasses, the wine glasses are actually branded. Other than the "JAPAN AIRLINES" mark, you can also see the RIEDEL logo on these glasses. Coffee of the Month from JAL CAFE LINES. Inside the menu, you can also find an insert for the JAL CAFE LINES, its exclusive line of high-quality coffee carefully selected by Mr. Yoshiaki Kawashima, a Japanese world-class Coffee Hunter (although Q Shoe Guy from FlyerTalk would disagree LOL). This is an insert to the menu probably because JAL updates the coffee menu monthly. The Coffee of the Month for my flight was "Grand Cru Café Summer Blend". Other than going into details on the background of this coffee, JAL has also provide a scale to describe its taste. Last is the "regular" beverages. The First Class menu contains way more choices compared to the Business Class one. For tea alone, there are 9 different choices (10 if you count the Queen of Blue too)! The western teas are made by Mariage Frères Tea of France but I didn't get the chance to try them thanks to the Queen of Blue and the Houji-cha.